Bishop Suarez leads worship for Synod leaders! What a blessing to have Bishop Pedro Suarez leading our Florida-Bahamas Synod! 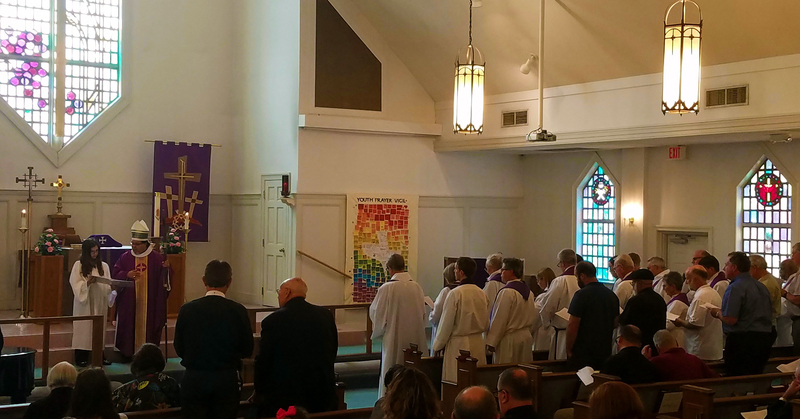 Suarez led a beautiful worship service at Salem Lutheran for pastors and church leaders in the area. Trinity was well represented with Pr. Bob, Denise and Jacob Schmalzle, Deacon Tim Romberg and Moises Carrasquillo. Pr. Bob participated in a "Renewal of Ordination & Consecrecation Vows" with other synod pastors. There was a consecration of holy oil that will be used for our baptisms, annointing of the sick, and the varied ministries of our deacons. Please keep Bishop Suarez and all of our church leaders in your prayers!